Your students will have fun learning all about idioms with this interactive Promethean Flipchart Lesson. Almost every page in this flipchart is interactive and covers many of the common idioms that students hear today. 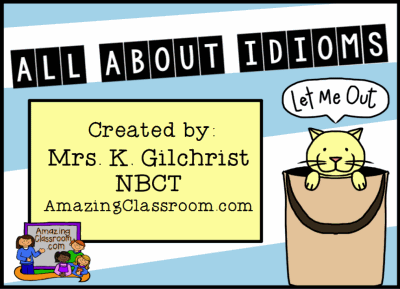 This page includes cute clip art depicting idioms, hang-man style games with interactive containers, drag and drop idiom match-up, as well as some voting with or without devices! Enjoy!